"I refuse to lose. I get my fingernails into the wall. You have to drag me away. I will not lose this fight." Amid the never-ending chaos of 18-hour days and the intense stress of running an Internet company, the employees of govWorks.com journey away from the city for a company retreat. While hiking through the woods, co-CEO Tom Herman stops the group within a peaceful grove of trees. For just a brief moment, everyone meditates and appears to forget about their struggles at the office. It will not last long. 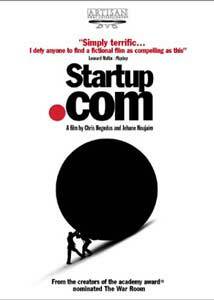 Startup.com documents the compelling true story of two long-time friends who start an Internet company and dream of attaining abundant wealth. Kaleil Isaza Tuzman and Tom Herman inaugurate govWorks.com, believing their concept is unique and that they can succeed among the numerous ideas springing up at the time. Their web site links citizens with their local municipalities and allows them to perform various functions, such as paying parking tickets, directly over the Internet. This concept does have considerable merit, and investors eventually flock to the idea and help to send the company spiraling towards prosperity. Beginning in May 1999 with only eight employees, Tom and Kaleil spend endless days trying to secure investors and develop their concept. Eight months later, govWorks has 120 employees and stands at the forefront of the dot.com craze. Helmed by first-time director Jehane Noujaim and renowned filmmaker Chris Hegedus (The War Room, Woodstock Diary), this documentary crackles in the excitement of the rise of new Internet companies. While Tom and Kaleil struggle with the direction of their creation, the unknown, energetic future looms with infinite possibilities. The camera follows their group everywhere, from countless hotel rooms to taxis, airplanes, and coffee shops. The style intimately draws the audience into the minds and emotions of these ambitious young men; sacrificing a pristine picture for better access, Noujaim and Hegedus bring us so close that it often becomes uncomfortable to witness certain heart-wrenching moments. When their third partner decides to back out, Tom and Kaleil face both a personal and financial crisis. They must strike a queasy business deal with a friend who's been there since the beginning, but this action is crucial to retain the status of their endeavor. Only a short while after its inception, govWorks has a value of over $50 million through various investors. Amazingly, it has yet to make a dollar of revenue and the site isn't even live. The future appears bright, but then an unthinkable disaster occurs that may crush the dream of numerous Internet pioneers: the crash of the stock market. And while this fails to end Kaleil and Tom's dream, it has a drastic effect that leads to serious troubles for the company. The apparently unending wealth available in this industry may not be there, and their exuberance diminishes under this realization. While this documentary covers the business side of the story, it is all the more effective because it shows us the human side of each character. Tom is an obsessive worker who spends countless hours on the job, but he also cares deeply for his daughter Tia. Their moments together present a pivotal everyday side of Tom that makes his ultimate destination much more difficult to take. On the surface, Startup.com chronicles the rise and fall of an Internet company and provides insight into the mindset of the time period. However, it also presents an emotional, intriguing story about two dedicated friends who lose much of their innocence within the struggles. Their bond makes this film more universal and transcends the corporate aspect of the story. In the end, their friendship remains, but the harsh difficulties have stained their hearts and removed the idealism that once existed. Image Transfer Review: Shot entirely on digital video, Startup.com appears in its original, full-frame transfer. Although the picture quality is below the usual expected from film origins, it still works impressively to convey the story clearly. While the focus is not always perfect, this adds to the realistic nature of this documentary. If the creators spent a large amount of time worrying about the technical aspects, they would ultimately miss pivotal human moments that are essential to the presentation. This transfer contains few noticeable glitches and remains very effective, given the limits of the equipment used. Audio Transfer Review: Much of the audio elements on this disc concern long periods of dialogue that hinder the chances for complexity in the transfer. However, this 5.1 track does feature several moments of considerable power and grace. The melodic score and intermittent songs work nicely and convey a decent level of force throughout the sound field. Also, the conversations need to be crystal-clear, and this transfer delivers, keeping any key moments from becoming too muddled or quiet. This disc also includes a 2.0 transfer that presents the events impressively, but lacks the power of its more complex companion. Extras Review: Startup.com features several impressive supplements that supply a wealth of background into Tom and Kaleil's story. The highlight is a commentary track from directors Jehane Noujam and Chris Hegedus. Instead of simply describing the events as they occur on the screen, both speakers cover elements of the story not included in the documentary. They comment on the difficulties of making this type of film and the technical aspects. Both Noujam and Hegedus have a tremendous amount of respect for their subjects, and this comes across specifically during this track. This commentary also includes numerous tidbits about individual scenes and the tough decisions required during the editing process. The disc also contains an extensive collection of production notes that provides compelling information about the origins of the project. The inset has a text message from each director, which concerns their ideas about filming these subjects. The notes on the DVD provide even more overall material on the process of creating this documentary. Noujam and Hegedus also appear on Documentarians on Documentary�a nine-minute piece that allows them to present even more aspects of the film. It begins by looking at the numerous ideas for the movie's name, including "Almost Millionaires" and "Lowly Millionaires." I think they made the right choice. The remainder of this featurette is an honest and straightforward conversation with the directors that never strays into ugly promotional territory. Another nice extra is an extremely comprehensive collection of biographies on the crew. The biography for Hegedus runs for fourteen pages and provides an exorbitant amount of background about her diverse and heralded career. Impressive entries also exist for Noujam, producer DA Pennebaker, and executive producer Fraser Pennebaker. There's also an intriguing widescreen trailer and a similar teaser, which includes quotes from critics. Startup.com showcases a unique, yet brief era of idealism and technological invention that came crashing down with the fall of the stock market. This riveting documentary delivers on both a personal and historical level and retains its energy through the pratfalls of Tom and Kaleil. Bolstered by several impressive supplements, this DVD comes very highly recommended.